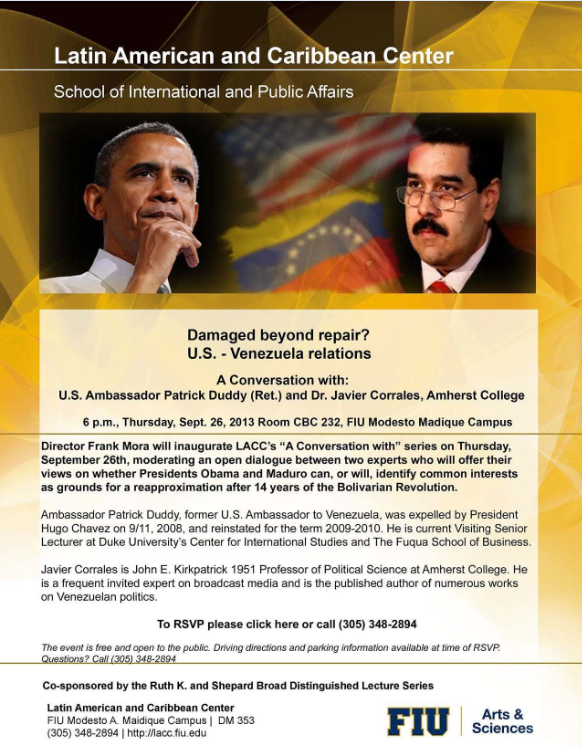 LACC’s “A Conversation with…” series launches at 6pm on Sept. 26 with Director Frank Mora moderating a discussion on whether there is an opportunity to thaw relations between Venezuela and the U.S. Discussants are Ambassador Patrick Duddy (Ret.) and Dr. Javier Corrales, Amherst University. Ambassador Duddy was summarily expelled from Venezuela on 9/11 2008 by then-president Hugo Chavez, only to be returned to his post in 2009. Javier Corrales has dedicated much of his extensive research to Venezuelan politics, and is a renowned author and frequent on-air expert on the topic.